Once or twice a week, the Detroit mother of three collects her loose change and buckets from her bathtub. She drives to a carwash and fills her buckets. This is how she’s collected water to bathe herself and her three children since the City of Detroit shut the taps to her home for nonpayment in June. “You never get used to it. It’s embarrassing. Here I am, 40 years old, filling buckets to get by,” said McCorkle, a supermarket cashier. Detroit’s aggressive water shutoff campaign has received international attention since it began in 2014, but until now, it was unknown how many people continue to live without service long after disconnections. For years, city officials said the vast majority of shut off customers have water running again within 48 hours when they are put on payment plans. 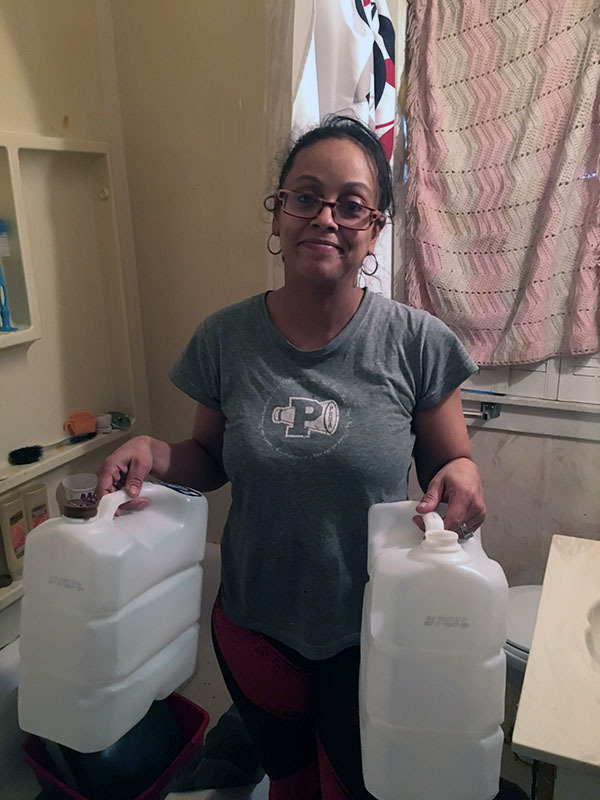 Now, new city records obtained by Bridge Magazine show occupants of least 1,500 homes – and perhaps as many as 2,715 – still remain without water after disconnections this year. That’s at least 1 in 7 of the city’s 11,422 shutoffs so far this year. More than 900 of those occupied homes have been without water at least three months. For the first time this year, the city’s Department of Water and Sewerage is tracking the number of occupied homes that aren’t reconnected, following a five-year collections campaign that has shut the taps to more than 112,000 homes. That’s more than all the single-family homes in Atlanta, Georgia. “This is a disgrace before God,” JoAnn Watson, a former City Council member, said at a recent protest about the shutoffs in downtown Detroit. Detroit has shut water to more than 11,000 homes this year, a dramatic decrease from more than 33,000 in 2014. Here’s a look at where shutoffs occurred. City policy calls for shut offs for delinquencies once bills are 60 days or $150 past due, and the crackdown began to increase collections and end what city officials called a culture of nonpayment. Gary Brown, director of Detroit’s Water and Sewerage Department, said disconnections have slowed significantly since their first year in 2014, when 33,000 homes were disconnected. Then, nearly 1 in 3 residential accounts were past due and the city needed to clean its books to lease the system to a new governing agency, the Great Lakes Water Authority. Now, 92 percent of customers are current on bills, Brown said. Detroit has dramatically expanded assistance efforts, Brown said, but the Water Department can’t solve crushing poverty in a city where nearly half adults don’t work. Forgiving delinquencies would increase bills for all other customers that already average about $80 a month, Brown said. “The message I’m trying to get across is that so many of these people who don’t have water, they’re not customers. They’re people who move into houses and don’t have a legal right to be there,” said Brown, speaking generally about housing turmoil that has led to some water shutoffs. They may not be customers, activists say, but they’re still human. “Some days, it’s all I can do not to cry,” said DeMeeko Williams, chief director of Hydrate Detroit, a nonprofit that provides water to McCorkle and others whose service has been disconnected. Like most in Detroit who survive without water, McCorkle’s problems didn’t start when the water stopped. A quiet woman whose home is decorated with pictures from her children and a drawing of Tupac Shakur, McCorkle has had a cascade of misery. Detroit water shutoffs from Joel Kurth on Vimeo. First came an eviction three years ago from a house she claimed was infested with rats. 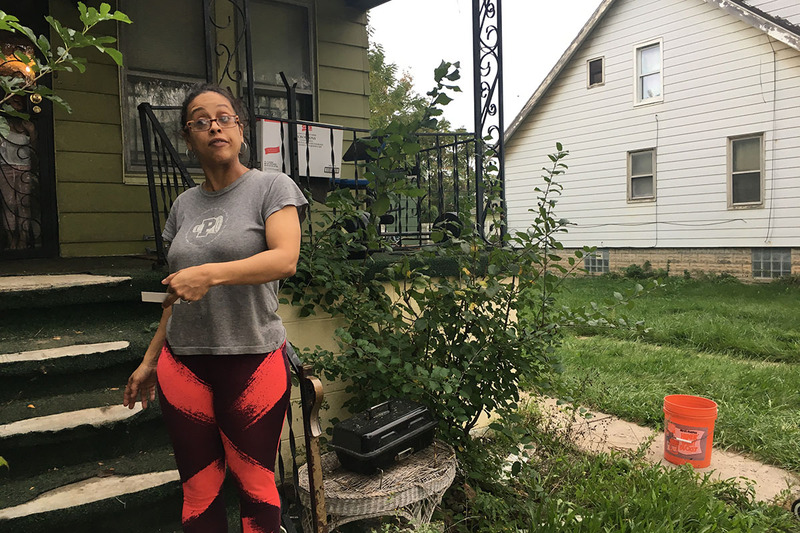 McCorkle said she withheld enough rent to scrape together $3,000 to buy a home in the shadow of the Marathon Oil Refinery in Southwest Detroit. Next, McCorkle said, she learned her new home came with a water debt of more than $1,500, pushing her monthly bill for the debt and regular usage to $200. Finally, she lost her job as a waitress and her water was disconnected for the first time last year. It was reconnected when she got help from a relief agency and entered into a payment plan, but McCorkle fell behind and missed three payments. In June, she turned on the bathroom faucet and nothing came out. Since then, McCorkle said she has done her best to pretend that’s normal for her children, ages 2 and 13. “I just tell them we’re struggling a little bit, but we’ll figure it out,” said McCorkle, who is working again as a cashier. Detroit officials said they've tried to help with the bill, directing McCorkle to an emergency relief fund and ordering repairs to her leaky pipes. Because of her payment history, though, she'll need more than $1,000 to get the water reconnected. Until this year, Detroit made no effort to determine how many people like McCorkle are living without water. In a city where 1 in 3 properties went through foreclosure in the past 15 years, a good percentage of disconnections that were never restored were believed to be in Detroit’s 50,000 vacant homes. This year, crews are returning to homes 48 hours after shutoffs to offer assistance and verify occupancy, said Bryan Peckinpaugh, a water spokesman. At least 1,568 homes believed to be occupied remained without water as of Oct. 2, the records show. The tally could be as high as 2,715, city records show, but verifying occupancy is tough in a city that also has one of the worst problems with squatting in the nation. “We’re trying to be transparent,” Brown, the water director, said about releasing the numbers. Detroit officials found that many without water take matters into their own hands: Of the 4,408 disconnected homes checked by the city, more than half, 2,720, were turned back on illegally, records show. It’s a relatively simple process done with tools purchased at hardware stores; apparently so common that water officials said some even advertise the service on social media. This year, the city sent notices to 25,000 customers warning of shutoffs and more than half avoided disconnections through payment plans or assistance efforts such as Water Residential Assistance Program. It offers up to $1,000 in relief and plumbing repairs and has helped more than 8,000 customers since 2016. A separate payment plan allows disconnected residents to repay their debts over time. This fall, the city is reaching out to 11 nonprofits to increase help, and hosting three assistance fairs. “We’re trying to help, but so many of these issues go beyond water and are about deep poverty,” Brown said. In fact, there is far more Detroit could do, water activists and some experts contend. They’ve pushed for years for the city to follow the lead of Philadelphia and adopt an affordability program that would base rates on household income and size rather than consumption. Philadelphia adopted the program last year because 1 in 5 residents were subjected to at least one disconnection since 2012. In 2014, Detroit kicked off a campaign to disconnect water to customers who were 60 days behind their bills. The effort was supposed to change a culture of nonpayment. Here’s a look at residential shutoffs by year in Detroit. Detroit City Council President Pro Tempore Mary Sheffield announced last month she planned to introduce ordinances calling for water affordability that would tier rates for the needy. She hasn’t had much progress. “The amount and resistance and pushback from DWSD, the administration and Law Department is unbelievable,” Sheffield told Bridge. The 1978 amendment to Michigan’s constitution prohibits governments from raising taxes without voter approval, and the State Supreme Court has ruled that basing utility rates on anything besides consumption is a tax. Brown said that court ruling makes affordability plans a non-starter. But that argument is rejected by Mark Fancher, staff attorney for the Racial Justice Project of the Michigan ACLU who has studied water shutoffs. “It’s a convenient excuse. The powers that be in Detroit just don’t want this to happen,” said Fancher, who argues the city is misinterpreting the ruling. Georgia water consultant Stacey Isaac Berahzer agrees. She has studied water costs and regulation nationwide and concluded Michigan law isn’t a “red flag” and Detroit officials could likely pursue an affordability plan. “Is it more beneficial to lose customers or put them on some sort of … assistance plan?” said Berahzer, the project manager of a University of North Carolina study last year about water costs. Brown, the water department chief, said basing rates on income would hurt poor people who keep up with their bills. The crackdowns are coming in part because cities for years deferred maintenance on infrastructure, causing water prices to rise. Nationwide, bills for a family of four overall have increased 80 percent since 2010, according to Circle of Blue, a Traverse City-based nonprofit that studies water issues. But few if any cities have used water shutoffs to the extent that Detroit has, experts say. The situation is exacerbated because Michigan is just one of seven states nationwide whose utility commissions don’t regulate water departments, allowing local systems to essentially operate as they please, Berahzer said. Back in Southwest Detroit, Williams – the water activist – dropped off bottled water to McCorkle on a cold October day, as he does whenever he can afford it. Interest in Detroit shutoffs has faded since 2014, when the campaign sparked condemnation from a United Nation panel. Williams’ group relies on donations. This year, he’s been able to pay back bills to restore water to seven families. His voicemail hotline is full of requests for help. As her children watched cartoons, Williams encouraged McCorkle to keep the faith. “I can’t see myself going back and forth to the car wash like this …” McCorkle said. Detroit Water and Sewerage Department isn’t the only utility that shuts off customers for nonpayment. DTE Energy, which serves 2.2 million customers in Michigan, reported 153,889 shutoffs for nonpayment in 2017, a decline of 36 percent from 2016, according to a company report this year. The vast majority of its electricity shutoffs – 99.6 percent in the first three months of 2017 – are reconnected after payments are made, said Chris Lamphear, a DTE spokesman. The decline was due in part because of a suspension in shutoffs during the company’s transition to a new billing system in mid-2017, Lamphear said, adding the company works with several social agencies to help customers. Mr. Brown is correct that poverty is a major driver in the inability to afford the unaffordable water rates in Detroit, but his analysis is lacking the naming of those poverty drivers. Or maybe this is something that builds on itself. Your neighbor doesn't pay his water bill and still gets service, why should you? And this gets shoved down the road, doesn't tale very long and you have a big problem and fewer people paying for water means you have to squeeze more out of those who do. Sometimes you have to be cruel to be kind. The basic problem is the way we have set up our water systems. Water is a life necessity and should be apportioned accordingly. We have profound wealth in our supposed Judeo-Christian country, but continue to punish people for poverty. Have to wonder, Matt, how we would be if we skipped the cruel and lived kind. Two things play in this scenario with Ms. McCorkle. Where is the Father? 5-6 Decades of Black Babies born to single Mothers with the vast majority in poverty already doesn't bode well. Second, is the demographic of Generational Comfortable Poverty. Culture needs to change, not utility / water policy. Mark, it is racist, classist AND sexist to imply that people's situation is the result of their previous decisions actions and choices.
" people's situation is the result of their previous decisions actions and choices." Bother yes it is LOL, thats how you ended up in your own situation, you automatically pull the "victim" card when someone doesn't like what you have to say. ive lived on 200/per week(rent was half my earnings), 0 excuses. Funny how people have 2-3 kids and they take pitty,Live within your own means, Stop trying to live a baller life style on highschool kids budget.